Historically, research examining health status disparities between members in different socioeconomic status and racial/ethnic groups often focused on adults and the concurrent lifestyle factors that might explain health differentials. Recent years have witnessed an explosion of interest in the developmental origins of adult health and disease, and life course-oriented research has proliferated across the social, biological, and health sciences. This chapter describes how an integrated life course health development framework can be applied to advance our understanding of the dynamic and multilevel processes contributing to health disparities across lifetimes and even generations. Examples of recent research that has examined health status disparities from a life course perspective are provided, and research gaps and challenges are reviewed. 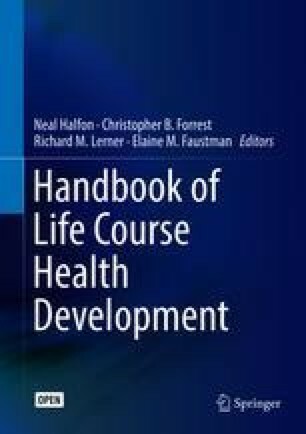 The chapter concludes with a set of recommendations for a more strategic and responsive life course-informed research agenda that not only can fill in gaps in current knowledge, but also pave the way for the translation of this knowledge into improvement in practice, programs, and policy aimed at alleviating health disparities. Health disparities on the basis of social class and race/ethnicity are apparent across a broad spectrum of health conditions at all stages of development from birth through older age (Tanner 2015). Historically, much of the research on health disparities has been conducted using cross-sectional data, often in adulthood, with the search for explanatory factors focused on current circumstances that might contribute to health status differentials between individuals in different social groups. Life course theories that seek to explain the developmental origins of and lifespan contributors to health status disparities have gained popularity in recent years, and life course-oriented research has proliferated across diverse disciplines spanning the social, health, and biological sciences (Burton-Jeangros et al. 2015; Kuh and Ben-Shlomo 2004). The goals of this chapter are to describe how an integrated life course health development framework can be applied to better understand health disparities, review examples of the types of life course-oriented research completed to date, identify gaps in knowledge, and provide recommendations for future research aimed at eliminating health disparities in childhood and through the life course. For the purpose of this chapter, the term “health disparities” is used to refer to differences in health status between members in certain population groups with a primary focus on socioeconomic status (SES) and race/ethnicity. Several articles discuss life course issues applied to health disparities (Alwin and Wray 2005; Braveman and Barclay 2009; DC Baltimore Research Center on Child Health Disparities Writing Group 2009; Wadsworth 1997), but principles, terminologies, and definitions of what constitutes a life course perspective vary across disciplines. Emerging from a synthesis of research across diverse disciplines such as life course sociology, lifespan developmental psychology, neuroscience, chronic disease epidemiology, and epigenetics, the life course health development (LCHD) framework provides an integrated account of the dynamic processes whereby diverse social and environmental exposures interact with biological forces from preconception onward to shape health development trajectories (Halfon and Hochstein 2002; Halfon et al. 2014a). Herein we briefly review how the following basic LCHD principles can be applied to health disparities: (1) health is an emergent developmental capacity of individuals that develops continuously across the lifespan; (2) health development is a dynamic nonlinear process occurring in multiple dimensions and at multiple levels and phases; and (3) health development is sensitive to the timing and social structuring of environmental exposures. Central to the LCHD theory is the notion that health follows a dynamic trajectory of development that begins before birth and extends through the full lifespan. Drawing on positive notions of health like the Ottawa Charter’s definition as a capacity that enables the individual to achieve life’s goals, health is conceived as an emergent set of capacities that develops across the life course as a result of transactions between the organism and its internal and external environments (National Research Council & Institute of Medicine 2004). Health develops continuously and progresses through phases beginning with the early formation of the organism in the preconception and prenatal periods, followed by the optimization of health and developmental capacity in early childhood through young adulthood, maintenance of health capacity in middle adulthood, and management of decline in health in late adulthood. At any given time an individual may be moving toward greater or lesser degrees of health. Applied to health disparities, the LCHD framework underscores the importance of examining how individuals in different SES and racial/ethnic groups may manifest varying trajectories of health development and highlights the need to examine not only differences in ill health and disease, but also subclinical health states, health capacity or potential, and a range of health outcomes that vary from poor to very positive. The LCHD framework incorporates an ecological (Bronfenbrenner 1992, 2005) and relational developmental systems perspective (Overton 2013a, b, 2014) to inform how health development is influenced by complex interactions among risk and protective factors across multiple domains and levels of organization over extended time frames. Physical, biochemical, psychological, social, and cultural domains dynamically interact to shape the health development process. The processes of health development also occur at multiple interacting levels of organization. Factors at the social and geopolitical level (e.g., social policy supports for healthy child development, institutional racism) influence factors at the community, family, and individual levels which, in turn, influence health development at the organ, cellular, molecular, and genomic levels. Processes at the molecular/genomic level can dynamically interact with each other, as well as with factors at the social and geopolitical level or anywhere in between. The search for explanatory factors for disparities in health associated with SES and race/ethnicity has typically focused on downstream factors such as individual health behaviors and access to health care. By incorporating an ecological perspective, the LCHD framework broadens the focus of potential explanatory factors to also include more upstream determinants like social policy- and community-level factors. From a relational developmental systems perspective, it is not surprising that health risk and protective factors tend to cluster together for individuals from disadvantaged backgrounds. The relations among risk factors, protective factors, and health outcomes are complex, dynamic, interactive, and nonlinear with exponential effects and tipping points. In contrast to traditional epidemiologic approaches that emphasize single risk factors and single health outcomes, a given risk or protective factor or combination of factors can lead to multiple different health outcomes (multifinality), and there are multiple different pathways to the same outcome (equifinality). Social determinants may be nonspecific such that, for example, poverty and disadvantage elicit exposure to stressors that result in multiple suboptimal outcomes across the physical, cognitive, and socioemotional domains. From an LCHD system view, it may not be possible to isolate the effects of any given risk or protective factor from that of others because their influence may be interactive and dependent on the array of other influences present in the system. Relationships among variables also follow dynamic patterns like feedback loops. For example, health may impact SES and SES may in turn impact health. Although exposures at all points in the life course impact health, those early in life are thought to be particularly important, due to heightened biological plasticity and behavioral sensitivity. This allows early experiences and events to condition biological and behavioral response patterns in ways that can be adaptive or maladaptive, influencing health development pathways into adulthood. The early social environment can impact health development over time through biological conditioning, pathway, and cumulative mechanisms (Hertzman and Boyce 2010). Biological conditioning occurs when experiences early in life quite literally get “under the skin,” altering neural, endocrine, immunologic, and even genetic systems that in turn impact the course of human development (Hanson and Gluckman 2014; Hertzman 2012; Hertzman and Boyce 2010). For example, exposure to specific antigens in utero will stimulate specific immune responses, and exposure to maternal depression during specific developmental phases can lead to alterations in the responsiveness of a child’s hypothalamic-pituitary-adrenal (HPA) axis as measured by cortisol output and effects. Although the focus has typically centered on the prenatal and early childhood phases, sensitive periods of heightened biological vulnerability to socially patterned exposures also occur at other stages including preconception and adolescence. Pathway models represent how exposures at one point in the life course impact exposures at another point which in turn impact health. Cumulative models emphasize the additive impact of risk and protective health exposures over time for individuals in different social groups. Chains of risk models combine elements of both to detail how individuals in different social groups can experience varied social, psychosocial, and biological chains of risk and protection that take a cumulative toll on health development across the life course. These models suggest how patterns of socially arrayed and interacting exposures can channel biological and behavioral adaptations in mutually reinforcing ways. For example, a child growing up in a low-income family might experience less-than-optimal language exposure and a low-quality family childcare experience, where he or she watches television or videos all day. That same child is more likely to attend a low-performing elementary school that is not responsive to his or her already depleted developmental potential. As a consequence of this child’s disadvantage, not only do they not arrive at school ready to learn, but a lower trajectory is further reinforced by a low-performing school that does not have the capacity to boost this child into a more promising educational pathway and subsequent life course health development trajectory. In addition to contributing to health disparity development across a lifetime, biological conditioning, pathway, and cumulative mechanisms can influence the transfer of differential health potential across generations. For example, a mother from lower SES origins may incur an accumulation of health-damaging exposures over a lifetime which increases her risk for gestational diabetes, and this in turn, along with differential feeding and health practices associated with SES, may heighten risk for offspring obesity. Despite the LCHD emphasis on the importance of timing and the social structuring of environmental exposures, the framework also details the potential for developmental plasticity and resilience at all phases of development, thus suggesting a need for research examining protective forces leading to more optimal health outcomes for those from disadvantaged social groups. Life course research that is relevant to understanding SES and racial/ethnic health disparities has expanded rapidly across a diverse set of disciplines. A full review of this literature is beyond the scope of this chapter, but the following examples demonstrate the types of research completed to date that begin to show the value of an LCHD perspective applied to health disparities. In the sections that follow, we briefly review research related to life course social disadvantage and adult health, the biology of social adversity, the intergenerational transfer of health disparities, and early intervention studies. A wide variety of international epidemiological investigations from studies spanning multiple decades have established associations between early life social disadvantage and adult health. Low childhood SES shows an independent association with a range of adverse adult health outcomes, including obesity, diabetes, cardiovascular disease, respiratory illness, cognitive decline, functional limitation, shortened telomere length—an indicator of early aging—and early mortality (Johnson and Schoeni 2011; Kamphuis et al. 2012; Packard et al. 2011; Pudrovska et al. 2014; Robertson et al. 2012; Strand et al. 2011). Studies with multiple indicators of SES at different points across the life course generally find that the risk of ill health and disease increases with more continuous lifetime exposure to lower socioeconomic status (Gustafsson et al. 2011; Luo and Waite 2005). Similarly, research examining racial/ethnic disparities in functional limitation, chronic disease onset, and early mortality demonstrates the important role of life course SES in explaining a portion of the black-white gaps in health (Haas and Rohlfsen 2010; Pais 2014; Warner and Hayward 2006). Studies in early adulthood have shown diverging trajectories of general health, body mass index, blood pressure, and respiratory function for those with different SES and racial/ethnic origins (Albrecht and Gordon-Larsen 2013; Jackson et al. 2004; Janicki-Deverts et al. 2012; Sacker et al. 2011). The complex associations between early social disadvantage and future health states are becoming better understood as research begins to provide plausible pathways for how childhood SES shapes early cognitive, physical, and behavioral development; future educational attainment; and long-term stressful exposures and health risk behaviors that in turn influence health outcomes (Hertzman et al. 2001; Luo and Waite 2005; Schoon et al. 2003; Van de Mheen et al. 1998). Most studies have examined the role of risk factor s in producing poorer health outcomes for those in more disadvantaged social groups, but some recent studies have examined how protective factors such as maternal warmth in childhood can buffer the effects of early social disadvantage and promote more optimal long-term health trajectories for those from lower SES backgrounds (Chen et al. 2011; Miller et al. 2011). The underlying biological mechanisms that contribute to health disparities are not clearly delineated, but research suggests possible avenues through exposures known to vary by SES and race/ethnicity, such as early psychosocial stress, maternal nutrition and related preconception health states, and environmental toxicant exposure (Thayer and Kuzawa 2011). A rapidly expanding literature on epigenetics has provided clues to potentially plausible mechanisms that might underlie biological conditioning by demonstrating how gene expression can be modified in response to environmental cues (Cole 2014; Hanson and Gluckman 2014; Meaney 2010; Meloni 2014; Misteli 2013). Although much of the early literature on biological conditioning came from animal studies, several recent epidemiological investigations have examined biomarkers of stress and epigenetic processes in human populations. Possible stress-related pathways between social adversity and health have received a great deal of attention in the literature. Adverse childhood experiences appear to be associated with enduring changes in the nervous, endocrine, and immune systems (Danese and McEwen 2012). Research has shown that childhood exposure to stressors such as abuse and neglect, maternal depression, and socioeconomic disadvantage shows both short- and long-term associations with future elevated HPA axis and autonomic nervous system reactivity, immune-inflammatory dysregulation, metabolic disturbance, and alterations in the structure and function of the regions of the brain that control emotions, attention, learning, and memory (Brand et al. 2010; Dougherty et al. 2013; Goodman et al. 2005, 2007; Miller and Chen 2007, 2013; Pietras and Goodman 2013; Sheridan et al. 2012). Studies that have examined epigenetic marks and DNA methylation patterns of individuals exposed to these types of stressors in childhood suggest a possible role for epigenetic processes in producing long-term alterations in physiological functioning (Anacker et al. 2014; Oberlander et al. 2008; Perroud et al. 2014; Romens et al. 2014; Tehranifar et al. 2013). Over time, alterations that contribute to repeated chronic activation of stress-responsive systems can lead to what has been termed “allostatic load” or cumulative wear and tear across a variety of physiological systems, thereby increasing susceptibility to many different types of chronic conditions at different stages of life such as asthma, learning disorders, psychiatric disorders, stroke, diabetes, and cardiovascular disease (Danese and McEwen 2012; Seeman et al. 2010). Early research on nutrition-related biological conditioning examined long-term linkages between low birth weight and future metabolic and cardiovascular disease risk that were thought to be attributable to the impact of undernutrition in utero on blood pressure regulation, cholesterol metabolism, and glycemic control, as well as the mismatch between in utero nutrient scarcity and calorie-dense environments after birth (Barker et al. 1993; Hales and Barker 2001). This work has expanded to investigate the role of a wide variety of specific micronutrients at distinctive phases in preconception, lifetime nutrient stores, and maternal metabolic and cardiovascular functioning and disruptions in the maternal-fetal interface, including placental function, uteroplacental blood flow, and fetal metabolism (Gillman 2005; Shapira 2008). For example, maternal gestational diabetes, which is more common in low-income overweight and obese women, is associated with fetal hyperinsulinemia and a higher risk of obesity and impaired glucose tolerance in the growing child (Gillman et al. 2003). Environmental toxicant exposures include a wide range of factors such as smoking and air pollution. Whereas most research has focused on the biological impact of prenatal and postnatal exposures, new studies are beginning to show possible transgenerational effects through epigenetic changes in the germline connected with smoke and toxicant exposure which provides an argument for the importance of the preconception health states of parents (Curley et al. 2011; Laubenthal et al. 2012). A growing line of epidemiologic research examines the early emergence of health disparities in childhood and the possible role of intergenerational mechanisms in contributing to early health disparities. Perhaps most suggestive of a role for intergenerational mechanisms is the fact that beginning at birth, large disparities on the basis of SES and race/ethnicity are already apparent for child outcomes like prematurity and birth weight (Coley and Aronson 2013; Gray et al. 2014). Studies that have examined associations of mother’s SES in her own childhood suggest long-term linkages with her future prenatal health, health practices, and reproductive outcomes (Astone et al. 2007; Gavin et al. 2011, 2012). In 2013, the preterm birthrate for African-Americans was 16%, compared with 10% for white women, with a near doubling of risk for low birth weight (13% vs. 7%) and near tripling of risk for very low birth weight (2.9% vs. 1.1%) (Martin et al. 2015). Although a low-income African-American woman who delivers a child 3 months prematurely might traditionally be assessed in terms of her delayed access to prenatal care, through a life course health development perspective, we would also consider her lifelong health status, her reproductive conditioning, the impact of experiences such as her own mother’s depression during her infancy, perceived racism, and other toxic and stressful experiences that potentially impact the structure and function of her HPA axis. A well-established literature indicates that the cumulative impact of stress-related weathering might have a major impact on the health of African-American mothers (Geronimus 1996; Geronimus et al. 2006; Holzman et al. 2009; Love et al. 2010). The weathering hypothesis, which is similar to allostatic load theory, proposes that, on average, the health trajectory of African-American women may begin to deteriorate early in adulthood as a physical consequence of cumulative socioeconomic disadvantage, stress, and racism. In support of this hypothesis, studies show a near fourfold increase in the risk of low birth weight and very low birth weight with increasing age for African-American women but not for white women (Geronimus 1996). Racial/ethnic disparities in measures of women’s health, such as obesity, high blood pressure, high cholesterol, and diabetes, also increase with age (Buescher and Mittal 2006; Geronimus et al. 2010; Miranda et al. 2010). Plausible biological pathways between social and environmental stress and birth outcomes include maternal HPA axis functioning, immune-inflammatory response, and vascular function altering uteroplacental flow (Kramer et al. 2011; Kramer and Hogue 2009). Preliminary research examining diverse biomarkers of risk for preterm birth suggests a possible role for proinflammatory pathways for African-American mothers (Brou et al. 2012). Continuing in early childhood, disparities by SES and race/ethnicity are apparent across a wide range of physical, behavioral, and cognitive measures, and these disparities appear to widen over time as children age (American Academy of Pediatrics Committee on Pediatric Research 2010; Flores et al. 2005; Halle et al. 2009; Larson and Halfon 2009; Martinson et al. 2015). A series of studies examining early child health disparities suggest a possible role for intergenerational transfer of risk through factors like parent SES origins and parent health and health practices. For example, studies have shown a possible contributory role for factors including grandparent social class, maternal psychopathology, maternal stress, and both pre- and postnatal maternal smoking in explaining SES gradients in children’s early asthma symptoms (Hafkamp-de Groen et al. 2012; Sternthal et al. 2011; Violato et al. 2009). Early parent health and health practices, including maternal mental health status in particular, have also been associated with SES gradients in children’s behavior problems, general health status, and obesity (Kahn et al. 2005; Khanam et al. 2009; Propper et al. 2007). For cognitive outcomes, health factors like mother’s preconception obesity, breastfeeding, and depression appear to make a small contribution to early gradients by SES along with a wide variety of additional early risk and protective factors (Dearden et al. 2011; Larson et al. 2015). A range of studies have examined the short- and long-run impact of early childhood interventions on future health and well-being. For example, early nurse home visiting programs for low-income families show long-term improvements for children including better intellectual functioning, fewer behavioral problems, fewer preventable injuries, and less risky health behaviors in adolescence (Olds et al. 1998, 2004, 2007). Parenting interventions in pregnancy and the first year have been shown to improve parent relationships, decrease family stress, reduce biomarkers of stress, and improve executive function and school performance of children (Feinberg et al. 2014, 2015). Whereas the focus has been more on social and educational outcomes, a number of preschool early intervention studies have tracked participant well-being into adulthood. For example, the Ypsilanti Perry Preschool study showed that an intensive multicomponent preschool program with teacher home visits for low-income African-American children improved adult educational attainment and literacy scores, employment outcomes, family relationships, and health practices (Schweinhart et al. 2005; Schweinhart and Weikart 1993). Several other educationally focused studies have shown similar results (Campbell et al. 2008; Reynolds et al. 2011). Recent follow-up studies of participants in the Chicago Preschool study, the Brookline Early Education Project, and the Abecedarian Project have shown health-focused benefits like more private health insurance coverage, less disability, less depression, better self-rated health, and less cardiovascular and metabolic risk (Campbell et al. 2014; Palfrey et al. 2005; Reynolds et al. 2007). Studies examining neighborhood-level interventions, such as the Moving to Opportunity study, which randomly assigned some low-income famili es living in high-poverty neighborhoods to receive free housing in more advantaged neighborhoods, have also shown some future improvements in health for participant parents, children, and youth, although results vary by outcome (Leventhal and Dupéré 2011; Ludwig et al. 2013). Few studies have examined interventions that begin in the preconception period, although one exception is the Magnolia Project, which targets at-risk African-American women of childbearing age who are not yet pregnant and provides multicomponent outreach services, risk reduction, well-woman care, health education, stress resilience services, and community development. Early evaluations demonstrate successful risk reduction with improved family planning and reduced STDs for program participants and marginally statistically significant improvements in low birth weight (Biermann et al. 2006; Livingood et al. 2010). Additional research is needed to determine the impact of social and health interventions beginning before pregnancy. Despite rapid advances in research relevant to understanding health disparities from a life course perspective, there are still many limitations and gaps in the knowledge base and the translation to policy and practice. In this section, we provide an overview of some of the important research challenges. Much of the developmental and life course research relevant to understanding health disparities has been conducted on data sources not specifically designed for this purpose. Pregnancy and prepregnancy longitudinal data sources are limited, especially in the USA. Few studies contain three-generational data spanning from grandparent to parent to child health. Research on the early origins of racial/ethnic disparities in health has been particularly hindered by the limited availability of pregnancy and prepregnancy cohort studies in the USA, and studies often exclude important groups and subgroups, such as American Indians/Alaska Natives, multiracial individuals, Mexican Americans, or Puerto Ricans, due to sample size issues. There is also a growing immigrant population who are underrepresented in data sets. Despite the many strengths of US longitudinal studies, such as the Early Childhood Longitudinal Study, the National Longitudinal Survey of Youth, and the Panel Study of Income Dynamics, these surveys do not primarily focus on health and have fairly limited direct physical health assessment. Much of the existing knowledge on the early biological origins of future health problems comes from animal studies, in part owing to the lack of available data sources containing both social and biological measures needed to delineate the complex pathways and interactions leading to health disparities. Understanding health disparities requires having well-defined measures of SES; race/ethnicity; potential explanatory factors across the biological, psychological, social, and cultural domains; and health outcomes (American Academy of Pediatrics Committee on Pediatric Research 2015). Measurement complexity begins with SES and race/ethnicity. Measures of SES are often chosen based on data availability instead of conceptual concerns. Standard approaches to categorizing race/ethnicity may need reconsideration with growing diversity and racial mixing, and many have noted the limitation that self-reported race/ethnicity should not be used as a proxy for genetic ancestry in biological studies (Eisenhower et al. 2014; Mersha and Abebe 2015). Several critical life course concepts such as stress, weathering, and allostatic load lack consistent measurement approaches, and little is currently known about how these concepts might best be operationalized at different stages of life including childhood and adolescence. Much work remains to develop adequate biomarkers for health and disease that can be applied consistently across studies. In the area of stress research, for example, short-term fluctuations in cortisol levels can complicate research findings, and hair cortisol, telomere length, and multifactorial approaches to the choice of biomarkers have been suggested (McEwen 2015; Sauvé et al. 2007). Social contributors to health disparities like discrimination, acculturation, or immigration stress also lack standardized measurement approaches. For health outcome measurement, limited measures of positive health states are available at different life stages. Measures are often not available in diverse languages and have not been tested for equivalence across socioeconomically and culturally diverse groups. Recent years have seen rapid advancement in the application of sophisticated statistical methods such as longitudinal growth models to examine health status trajectories, multilevel modeling to examine contextual influences on health, and decomposition methodologies to sort through the contribution of multiple risk and protective factors at different life stages to future health status disparities. Despite progress, there are some fundamental limitations with standard statistical approaches that stem from a reductionist approach aimed at isolating the “causal” impact of a given variable. Studies that examine mediators or contributors to health status disparities using standard regression approaches are inherently limited by possible residual confounding and may miss important connections if associations among risk factors, protective factors, and health outcomes are complex, interactive, reciprocal, or nonlinear. New methods of analysis stemming from dynamic systems approaches have the potential to complement more traditional analyses and incorporate many different aspects of the complexity inherent in the LCHD framework, but to date there has been limited application to the field of health disparities (Diez Roux 2007, 2011; Speybroeck et al. 2013). Dynamic systems methods include a range of computational approaches that can be used to model dynamic interactions between individuals and their environments, and complex phenomenon including feedback loops and nonlinear relations. Comparing the current state of research on the early origins and development of disparities in health with existing life course frameworks reveals several limitations and gaps in knowledge. While the LCHD framework emphasizes the critical importance of structural and upstream policy- and community-level determinants of health status disparities, most research has focused on more downstream factors, such as health behaviors or health care. With the growing popularity of research on toxic stress, epigenetics, and the role of early pre- or postnatal programming of future health states, some have cautioned that the field should not lose sight of the broader structural forces like racism, environmental inequity, and decaying housing structures that can impact health across the life course (Geronimus 2013). There is also limited research available on resilience and the role of protective factors in promoting positive health trajectories for individuals in disadvantaged social groups. Most studies have investigated poor health and disease outcomes rather than functional health trajectories and biomarkers of future health potential. Overall, knowledge of the complex mechanisms whereby biological, environmental, social, and behavioral factors interact over extended time frames to produce disparities in population health is limited, and many critical questions remain unanswered, such as the ongoing debate about the importance of early vs. later events and the timing and mutability of critical or sensitive periods in human development. Despite the recent upsurge in research activity on health disparities in the USA, progress toward meeting the US Department of Health and Human Services’ Healthy People goals of reducing or eliminating health disparities has been slow, and gaps for socially disadvantaged groups are, in fact, increasing for certain key health indicators such as infant, childhood, and adult mortality (Singh and Kogan 2007; Singh and Siahpush 2002). Indeed, a recent analysis of US data on trends in child health disparities documented that children from ethnic minority families continue to experience multiple disparities in medical and oral health and health care, with most disparities persisting over time and some new disparities arising (Flores and Lin 2013). Currently, few evidence-based practice guidelines are available to address specific health disparities, and there is no fully coordinated national policy effort to address disparities. Although there is a growing trend focusing on translational research to integrate knowledge from basic science studies into practical solutions in the clinical, practice, population health, and policy realms, much of the past research on health disparities has had a greater focus on documenting disparities than providing actionable interventions. The evidence base on effective health interventions is limited in several ways. Many of the long-term follow-up studies tracking early childhood interventions have primarily been conducted in the field of education and therefore lack a specific focus on health outcomes or on the biological and behavioral adaptive mechanisms that might explain long-term outcomes. Few interventions have been designed to target specific social and health risk and protective factors prior to pregnancy, and we still know very little about the best time to intervene to influence specific health outcomes. Interventions for racial/ethnic health disparities are often not specifically designed to meet the unique needs of individuals in diverse cultural groups, and few studies have examined community-level interventions or the impact of interventions designed to optimize health instead of reverse risk factors. Despite these limitations, a range of early intervention studies demonstrate promise for improving future well-being for children in disadvantaged home environments, and yet these have not been implemented in practice on a broad scale in the USA, indicating a need for policy change and a greater focus on scaling up proven strategies in community-based practice. Addressing disparities in health in the population at large will require attention to the parental, early childhood, and adolescent antecedents of later inequality in health. New research on health disparities from an LCHD perspective will require transdisciplinary collaboration and training in order to advance unified theoretical concepts and measurement approaches and to further research on the complex interplay between social and biological forces in producing health disparities across lifetimes and generations. Similar collaborative efforts are needed to translate knowledge from basic science studies into interventions, programs, and policies that can optimize long-term health development trajectories for individuals from disadvantaged social groups. Investigate the underlying biological processes that contribute to health disparities in human populations. Examine protective factors, resilience, and positive health outcomes for individuals from disadvantaged backgrounds. Examine parental preconception health and other intergenerational mechanisms that may contribute to early health disparities. Continue to investigate the dynamic multilevel contributors to health status disparities across the life course with a particular emphasis on upstream determinants. Compare the impact of the timing of intervention at various life stages for selected health outcomes. Shift beyond minimizing risk and preventing poor health with interventions aimed at optimizing health and developmental potential. Address barriers to reliable widespread implementation of evidence-based interventions. Use place-based and community-based participatory research methodologies. Develop and test new policies and policy interventions at the local, state, and national levels to reduce health disparities across the life course. Shift to focus on longitudinal as opposed to cross-sectional studies. Combine sociodemographic, biologic, and genetic data and link across families. Develop new measures of health and possible contributors to health status disparities validated across different racial/ethnic groups. Adopt a complex systems perspective. Improve training in transdisciplinary research and advanced statistical modeling. Identify existing knowledge that is ripe for translation to practice and policy. Align new basic science research with translational approaches to reducing health disparities. Need for more funding by NIH, MCHB, and other federal agencies and national foundations for life course-oriented health disparities research. Capitalizing on new momentum, interest, and recognition of the importance of social determinants and toxic stress for health disparities in childhood and across the life course. Below, we describe these priority areas in greater detail. Population, regional, and clinic-based studies are needed to examine the underlying biological processes that contribute to health disparities in human populations. Studies should examine biological processes impacting health at all stages including birth outcomes, child and adolescent health, and adult health. Priority research areas include the investigation of novel biomarkers of health and disease for populations that are particularly affected by disparate health outcomes, the contribution of stress and allostatic load to health disparities at various life stages, studies of gene-environment interactions and epigenetic mechanisms of health disparities, identification of genetic susceptibility to disease among minority populations, and studies examining gestational/prenatal physiology and its impact on future health disparities. Despite lower economic resources overall, certain racial/ethnic and immigrant groups such as Mexican Americans and blacks born outside the USA show surprisingly good outcomes for certain health indicators like child birth weight and longevity (Buekens et al. 2000; Lariscy et al. 2015; Singh and Hiatt 2006). Likewise, many individuals from lower SES origins manage to overcome the odds and have very good health and well-being in adulthood. More research is needed to not only identify individuals with exceptional health resilience, but also to better understand the health development pathways that lead to a more resilient phenotype. Studies that examine the cultural, social, and psychological resources that can lead to thriving and better-than-expected health outcomes for individuals from disadvantaged social groups should receive priority. Examples of recent research in this area include studies showing long-term benefits of maternal warmth, child optimism, and shift-and-persist strategies for future health and well-being of individuals from lower SES origins (Chen et al. 2011, 2012; Khullar et al. 2011; Miller et al. 2011). The LCHD framework points to the importance of addressing the early manifestations of health disparities and intergenerational transfer of health risk and potential. Studies are needed to examine the mechanisms contributing to disparities in birth outcomes, biomarkers of future health potential, and early childhood health. Priority areas include three-generation studies that examine how social factors from parent’s own childhood may influence their future health, well-being, and parenting practices with consequences for offspring health and the role of parental preconception health status. In the biological realm, an important area of research is the role of the placenta as a regulator of the intrauterine environment and programming agent of future health potential and how this ties in with the social, physiological, and nutritional status of the mother. This might include studies that focus on the potential to boost placental functioning so that the placenta might serve as a resilience generator in what might otherwise be a risky intrauterine environment. Future research should investigate the multilevel contributors to health status disparities over the life course with a particular emphasis on upstream structural factors and neighborhood-level determinants. Multilevel studies can help examine the impact of neighborhood-level factors on health disparities by SES and race/ethnicity. Also needed are studies that incorporate longitudinal or life course measures of neighborhood and environmental exposures. At the population level, studies are needed to examine the policy, built environment, and social environment exposures that contribute to geographic differentials in rates of health and disease. To the greatest extent possible, research studies that examine lifelong contributors to SES and racial/ethnic health disparities should investigate the importance of timing of key environmental and social exposures. In addition to empirical studies that are designed to measure the impact of specific environmental exposures on biological conditioning and health, existing data can be used to develop life course health development models using new agent-based and dynamic systems methods. These modeling approaches can represent dynamic interactions and complex multilevel influences over varying time horizons in ways that may be difficult using standard statistical approaches. Longitudinal studies are needed that investigate the impact of interventions at various life stages on future health outcomes. The preconception period is an important area for investigation. Many questions remain about the possible benefit of and best timing for interventions in the preconception period for improving birth outcomes and early childhood health in disparity populations. Studies in childhood should examine social interventions designed to alter specific short-term health outcomes (e.g., asthma or early stress reactivity) in at-risk populations as well as more long-term health and well-being outcomes into adulthood. For example, can population-level interventions, like teaching young children yoga and other mindfulness techniques, serve to “inoculate” them against elevations in allostatic load due to stressful and chaotic family environments? Questions about the best timing for intervention are important. Cost-effectiveness studies can be used to compare the value of interventions at different life stages. In addition to interventions at the individual level, studies that intervene on the multilevel determinants of health (e.g., neighborhood-level interventions) will also be important. Most prior intervention studies have been designed to alter risk behaviors in disparity populations. Few have examined if interventions designed to build individual, family, or community strengths can optimize health trajectories. As an example, a recent study showed that a psychosocial intervention focused on building family strengths and youth competencies was successful in improving biomarkers of health in early adulthood for African-American youth in lower SES families (Miller et al. 2014). To date, we know very little about the potential of interventions that seek to promote optimal health, nutrition, fitness, parenting, and social, psychological, and community resources in health disparity populations. Intervention studies to address the SES gradient in health will also need to focus on optimizing health across the full SES spectrum, including not just low but also middle SES groups. Prior studies have often focused on the problems of poverty and marginal risk without adequate attention given to individuals in more middle-income groups, who also exhibit suboptimal health outcomes and could benefit from interventions designed to boost their health and developmental potential. Some evidence-based interventions for improving health and well-being exist but have not yet been implemented in community-based practice on a broad scale. Some existing health interventions have not yet been tested for specific cultural groups such as Native American populations. Dissemination and implementation research is needed to help spread knowledge about existing evidence-based interventions, adapt interventions for use with specific cultural or regional groups, and test the effectiveness and cost-efficiency of different interventions in community and practice settings. Community-based participatory research involving collaboration and partnership between community leaders, residents, and academic researchers can be used to help design interventions that are responsive to local needs and promote policy advocacy in disadvantaged neighborhoods. Recently, many place-based efforts have taken a life course approach in attempt to improve cradle-to-career trajectories with attention paid to what works in different kinds of communities and microenvironments. Community-based researchers in Canada have used a new set of measures including the Early Development Instrument (administered from ages 4–6 years) and the Middle Development Instrument (administered at ages 9–11 years) to collect developmentally and dimensionally consistent measures of health development (Janus and Offord 2007; Schonert-Reichl et al. 2013). This life course-oriented population data collection can be used to map and track health and well-being at different developmental stages, and to engage community members in identifying early development outcomes and how they relate with local community services and risk and protective factors, and in turn developing action strategies for systems- and community-level improvements. Translational research is needed to transform knowledge from basic science research into new policies designed to reduce health disparities through the life course. As new social and health policies are devised, research will need to monitor impact and outcomes. For new policy development, computer simulation studies provide an important and, to date, underutilized methodology that policymakers can use to test the likely outcomes of policy changes to address the more upstream determinants of health (e.g., changes in income or education) and test what-if scenarios about the likely impact of alternative early intervention strategies targeting different early risk and protective factors for future health outcomes. The USA should invest in longitudinal studies that start prior to conception and continue through the life course. Ideally, these longitudinal studies should also collect data on the subsequent generation of children. Despite the difficulties implementing a large-scale study like the US National Children’s Study, efforts must continue to investigate new methodologies to make a population-based cohort study like this possible, and smaller-scale regional studies collecting social and biological data on critical life course topics should also receive priority. Existing cross-sectional data sets, such as the National Health and Nutritional Examination Surveys (NHANES) and National Survey of Children’s Health (NSCH), could be enhanced by adding longitudinal components, linkages with vital statistics and other available data sources, and retrospective measures of parent’s life course health, socioeconomic status, perceived racism, and risk and protective exposures. Ongoing longitudinal studies, such as the Early Childhood Longitudinal Study (ECLS), the National Longitudinal Survey of Youth (NLSY), and Panel Study of Income Dynamics, could be altered to include better health measures. Where possible, researchers should also explore innovative options for expanding and cross-linking data contained in sources like electronic health records. Longitudinal and cross-generational studies are needed that integrate sociodemographic, biologic, and genetic data. Ongoing and future epidemiologic studies used to investigate health disparities should be examined for opportunities to add biological and genetic data that might contribute to our understanding of life course processes. For example, new studies to investigate social disparities in preterm birth and early childhood health outcomes could add biological information such as maternal blood, DNA, urine, and placenta samples and fetal amniotic fluid and cord blood samples. Likewise, new biorepositories designed to study specific health conditions and built with connections to clinical and questionnaire or epidemiologic data may provide useful opportunities for future health disparities research. At present, there are few valid and reliable measures of health not measuring disease, disability, or dysfunction. New measures of health in childhood, adolescence, and adulthood are needed that can be used to study functional health trajectories and positive health outcomes. This will require better conceptualization of health and health development from a measurement implementation standpoint and creation of multimodal health development profiles that include self/parent report, clinical measures, and biomarkers. Research designed to develop standardized measures of critical life course concepts like stress, weathering, and allostatic load at different life stages should also have priority. New measures should be validated for use across different cultural groups. Adopt a complex systems perspective . Complex systems approaches are gaining popularity in public health. Systems approaches can be used to investigate complex phenomenon including feedback loops, nonlinear dynamics, and macro-level patterns that emerge from the interactions of factors at different levels of organization. Applied to health disparities, complex systems approaches may help broaden our understanding of processes like the reciprocal relations among genes and environments across the life course, feedback mechanisms between health and social standing over time, dynamic interactions between people and places in producing health disparities, and the long-term consequences of intervening on structural determinants of health such as early childhood educational opportunities (Diez Roux 2011). Advancing life course-focused research on health disparities will require collaboration among researchers from many different specialties and fields of study. Traditional academic training has been discipline specific, but new modes of training are needed to provide exposure to different research methods used across diverse fields of study. Applied researchers will need advanced training in the interpretation and use of sophisticated statistical methods ranging from longitudinal growth modeling to dynamic systems approaches. Social scientists will need to incorporate knowledge of concepts and methods traditionally used in the biological sciences and vice versa. Application of existing knowledge from life course-oriented health disparities research to practice and policy is still in the early stages of development. Efforts are needed to identify existing knowledge that is ready for translation into concrete practice guidelines, programs, and policies aimed at alleviating disparities in health in childhood and across the life course. For example, life course-oriented research focused on optimizing health development could be used to redesign the health-care system with a greater emphasis on promoting optimal health throughout the life course, from birth through death, instead of focusing on disease management (Halfon et al. 2014b, c). Continued efforts are needed to identify ways in which life course research on health disparities can be integrated into medical, social welfare, education, and public health practice and social and health policies at the local, state, and national levels. Historically, research on health disparities has often been conducted in isolated academic institutions without primary attention to how the knowledge gained from basic science studies might be applied in practice or policy. New modes of research involving transdisciplinary collaboration, academic and community partnerships, and new translational research science centers that conduct studies across the continuum from basic science discovery to their application in clinical, practice, and policy settings may help ensure that new discoveries are translated into concrete and practical solutions to promote health for disadvantaged populations. Need for more funding by the National Institutes of Health (NIH), Maternal and Child Health Bureau (MCHB), and other federal agencies and national foundations for life course-oriented health disparities research. Funding declines and tight competition for federal research grants offer a challenge to moving forward in the many areas needed to advance life course-oriented health disparities research. More funding by NIH, MCHB, and other federal agencies and national foundations is needed for life course-oriented health disparities research with a special emphasis on intervention and translational research designed to reduce health disparities in childhood and through the life course. The LCHD framework emphasizes the importance of addressing disparities from preconception onward; understanding that early exposure to multiple stresses may produce biological changes that are difficult, if not impossible, to eradicate later; and acknowledging that adults who experienced the most extreme disparities as young children are likely to develop the worst health in adulthood and require the most expensive interventions. Life course-oriented health disparities research provides an opportunity for large potential savings associated with the development of strategies to intervene early in optimizing human health. Despite challenges, interest in life course-oriented health disparities research has gained rapid popularity in recent years. For example, interest in research on the lifelong health consequences of early adversity has rapidly spread and is currently being translated to changes in medical, public health, education, and child welfare practice including the development and expansion of new trauma-informed systems of care. Several states now track and monitor rates of adverse childhood exposures. Just over a decade ago, life course models were relatively marginal in the Maternal and Child Health (MCH) field but are now foundational in guiding MCH research, practice, and policy (Lu 2014). Within pediatrics, attention to poverty and the social determinants of children’s health and development has also grown in response to increasing rates of US family poverty. The emerging research on poverty, toxic stress, and epigenetics has been used to frame new American Academy of Pediatrics (AAP) recommendations concerning screening for early adversity and social risk at primary care visits and building pediatric connections with social and educational services in the community to help promote optimal health and development for all children (American Academy of Pediatrics Committee on Psychosocial Aspects of Child and Family Health, Committee on Early Childhood, Adoption, and Dependent Care, & Section on Developmental and Behavioral Pediatrics 2012). In recent years, both the AAP and the Academic Pediatric Association have placed poverty and child health as a top policy focus. This growth in attention to social determinants and life course health is encouraging. Research innovation and enhanced support for translational science approaches will be needed to devise and implement practical solutions to address life course health disparities in practice and community settings. Although researchers, policymakers, and clinicians have recognized the existence of health disparities for decades, the importance of social, developmental, and health inequalities in the early years as contributors to lifelong differences in health status has only recently been understood. Attempts to address health disparities in the US population that do not include a strong focus on the early years are, at best, misguided and, at worst, likely to fail. At the national level, difficult conversations are needed to address research priorities and strategies for targeting social inequalities. At the same time, life course health development models suggest that there may be new solutions to long-standing problems. Rather than ever-increasing spending on expensive mid- and late-life therapeutic interventions, many of the answers to persistent disparities in health outcomes could lie in better social conditions and health development services for young children.